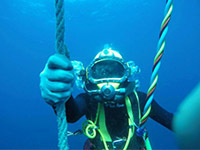 The closed bell mixed gas saturation qualification is the highest level of commercial diver training a diver can reach during his career as a diver. 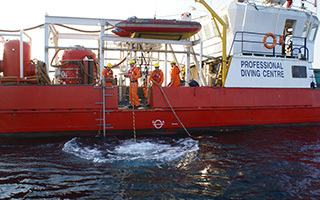 The diver must hold an IMCA / U.K H.S.E or IDRF 50 metre offshore qualification and have worked for one year having 50 hours logged before being allowed to attend training. The training can be done in Durban in the open sea where the diving depths range from 10 metres a quarter mile out to 270 metres plus only 5 miles off the harbour mouth. The courses are run by international instructors from the SA and the UK who have been working offshore as saturation supervisors. The training requires an actual dive to 100 metres and long lock outs are provided using reclaim helmets. The course qualification is recognized by IMCA. While the deepest bell-training dive on the saturation course is over 100 metres, saturation diving work in the oil & gas industry is carried out in both shallow and deep waters. You must have dived commercially within the last 4 months / 120 days. 100 dives totalling at least 100 hours, none shallower than 6 msw and all in open water in Surface Supplied equipment. 20 Dives must be over 15 metres. No dive with a bottom time less than 15 minutes may count. Where the dive lasts longer than 2 hours only 2 hours may count towards the total. Have a valid Diver Medical before starting. This can be done at the dive school on first day of course. English Language: Be able to understand, write and be able to communicate verbally, and communicate easily with others in English. Besides having the working dives and hours you must be a competent commercial diver who is very comfortable in the water working. NB: Please make sure you fully understand this English Language requirement as the course is run in English only. Unfortunately we do not speak any other languages which you may do. Students will be removed from training and not receive a refund if they arrive and cannot cope due to English language issues as this is a safety issue for all students and staff. We have sent home many divers during air training and will continue to do so with the mixed gas training, so please take note of this warning and make sure you understand it. Be able to add, subtract, multiply and divide whole numbers, decimals, calculate percentages and transpose formulas and solve simple formulae eg. Gas laws in the English language. Remember we do more than the minimum training on courses as the minimum reduces diving job opportunities and limits a divers career.